We start off with our regular disclaimer. Sugoistuff is not affiliated with any of the company or products mentioned here. All products featured in this post were personal purchases and we received no payment monetary or otherwise for posting about it. We recently had our Christmas vacation in the motherland and we had to fly there with a layover at Haneda International Airport. We saw these fun sweets on our first flight but decided to buy them on our return trip instead. They are sold in many of the souvenir kiosks in the airport. The baby likes it so much, I often would hear him say an appreciative “hmmmm” when he eats one. 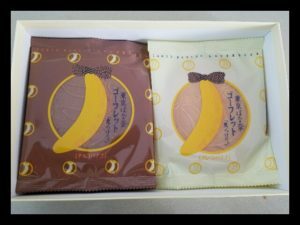 Banana shake-flavored white chocolate sandwiched luxuriantly between cute langue de chat cookies baked in a banana silhouette shape. The baby and I like the cookies better. We bought a box for about 1,020 yen. Light sweet banana flavored cream sandwiched with two types of specially made crispy wafers, one with plain flavor and the other with chocolate flavor. These were like large round hard wafers in chocolate banana and vanilla banana flavors. 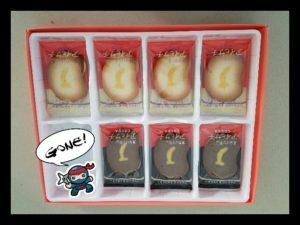 A box of 16 pieces costs about 1,030 yen. We like these because they are light, flavorful snacks that is good with either tea or coffee (hot or iced). The banana flavor is subtle unlike other fruit flavored snacks that can come off too strong like medicine. The sweetness is also just right, not cloying. For more details, you can visit Tokyo Banana. … is virtually a free spirit who loves independent movies, literature, graphic novels, pop culture, music (especially indie rock and jazz), food, cooking, vintage fashion, and Alpha Males. Read more Flori melodrama on Short Term Effect .